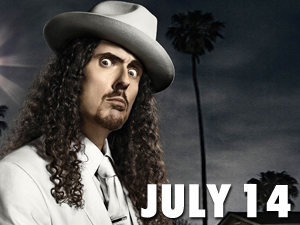 Home > News > News > It’s Weird Al Yankovic – LIVE this July! It’s Weird Al Yankovic – LIVE this July! Quirky, humorous, witty and irreverent – all words that certainly describe Weird Al Yankovic, the foremost song parodist of the MTV era. On Thursday, July 14, Weird Al will be performing his outrageous comedy classics and pop culture parodies as only Weird Al can! Tickets go on sale to Members on Wednesday, June 8 and to the public on Saturday, June 11. Don’t miss your chance to witness the craziness of Weird Al Yankovic! AMT Members can purchase tickets to concerts before the general public – click here to find out how.